The US economy is threatened by two giant problems which cause all others to pale into insignificance. We are referring to a rogue central bank that has become an absolute enemy of capitalist prosperity and a fiscal doomsday machine that is hostage to the ceaseless budgetary demands of the Warfare State, the Welfare State and the Baby Boom’s demographic imperatives. Needless to say, both ends of the Acela Corridor are completely oblivious to these twin menaces. Indeed, they are the proverbial elephants in the room, thereby giving rise to a considerable irony: To wit, the GOP party of the elephant, which is supposed to be the palladium of financial rectitude in American politics, has forgotten about them completely. For instance, in his triumphalist SOTU, the Donald didn’t utter so much as a single syllable about the Fed, the budget, entitlements, the $1 trillion per year deficits looming ahead or the nation’s soaring public debt. Yet after omitting virtually everything which counts, he went on to crow about how he is making America Great Again (MAGA) by making better trade deals and borrowing untold sums from future generations. Oh, and there was also his $33 billion Mexican Wall, 5,000 new border patrol agents (in addition to 20,000 already) and Federalization of two purported crises—the opioid epidemic and gangs like MS-13—-which should be a matter for local government, if the latter have any purpose at all. As to the Wall Street end of the corridor, we got a good reminder of that during our appearance on Bloomberg TV last evening. The host objected to our fiscal warnings on the grounds that these threatened CR (continuing resolution) showdowns and debt ceiling crises arise episodically, but after a lot of partisan fire and brimstone they always get resolved. The implication was that the fiscal file embodies just a messy process equation, but the pols eventually and reluctantly do their jobs. Accordingly, Wall Street’s cynicism about the matter is understandable and justified as in: Nothing to see here. Move along! Needless to say, we beg to differ. In fact, the budget process is so utterly and irretrievably broken that by default Congress ends up kicking the can for want of an alternative; it’s evidence of serial failure, not of rising to the occassion. The degree to which this has become institutionalized also became starkly evident yesterday when the new GOP chairman of the House budget committee, Rep. Steve Womack (R-Arkansas), announced that he wants to dispense with the legally required budget resolution for FY 2019 on the grounds that getting a consensus in an election year is just too hard! “If I can read the tea leaves on what’s coming from the Senate, that doing a budget resolution that will be meaningful, that we can get House and Senate together on, is very problematic right now,” the Arkansas Republican said at a Thursday press conference here, where GOP lawmakers were having their annual retreat…… Of course, we add to the fact that it’s an election year and that makes it even more difficult to get things done,” he added. Let’s see. The House GOP majority had no problem passing an unfinanced tax cut bill which will add $280 billion to the FY 2019 deficit alone; or approving $85 billion of disaster relief with no off-setting cuts or revenues; or enacting a $700 billion defense authorization with hardly a dissenting vote, while knowing that it would require busting the sequester caps by upwards of $80 billion. Yet the once and former party of fiscal rectitude has apparently now found a Congressman from some Arkansas trailer park to head the budget committee, but who doesn’t want to bother with the real job of Congress, which is to safeguard the nation’s fiscal solvency. Here’s the thing, however. Can-kicking has an inherent sell-by date. Hence the very nomenclature of it. Yet there should never have been any mystery to economic conservatives as to the soaring public debt. To wit, the ills that have been ascribed to it from time immemorial were certain to reappear at the time that the Fed and other central banks stopped monetizing it. After all, massive QE is, well, a massive fraud. It involved the removal from the global bond markets of upwards of $20 trillion worth of sovereign debt and other securities since 1995 by central banks, thereby tilting the market clearing yield sharply lower. At the same time, the fiat credits snatched from thin air by the central banks to pay for these QE purchases flowed back into the financial markets where they became buying power for other securities such as corporates, junk bonds, ETFs, equities and various forms of Wall Street confected bespoke trades (gambles); or in the case of so-called excess bank reserves, they were hypothecated in support of bank borrowings that indirectly fattened the bid for risk assets. At the end of the day, the QE bonds ended up sequestered in central bank vaults—even as the consequent rising pricing for these same securities encouraged private speculators to extract even more trillions of bonds from the trading pits. This was accomplished by sequestering notes and bonds in the next best thing to a central bank vault. That is, a repo trade where said securities could be immobilized indefinitely by adroit traders, hedge funds and dealer prop desks making use of overnight funding pegged at zero cost by the Fed and other central banks. So if the now apparently de-feathered GOP deficit hawks wondered how they got away with kicking the fiscal can for so many years, the smoking gun is embedded in the chart below. The Fed and other central banks had their Big Fat Thumb on the supply/demand scales in the markets for savings and debt. The “crowding out” effect and rising yields that enforced fiscal rectitude in the pre-Greenspan era were unplugged by Keynesian central bankers who discovered that having the central banking branch of the state print money is a lot more efficacious—as least in the middle term—than having the Treasury borrow it honestly in the capital markets. Alas, even the middle-term is over. 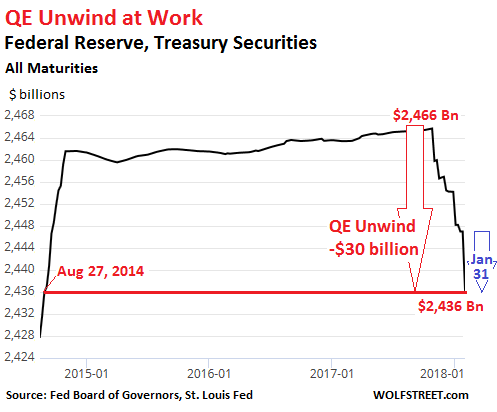 With the books now closed on January, it is evident that the Fed has indeed made an epochal pivot to QT (quantitative tightening) and is shrinking its balance according to the automatic pilot plan it has set in motion. Thus, during the current quarter it intends to let $12 billion per month of maturing treasury debt and $8 billion of GSE securities roll-off, which from a market pricing viewpoint amounts to the same thing as selling them. That’s because neither Uncle Sam nor Fannie/Freddie are shrinking their own balance sheets. Instead, what the Fed doesn’t repurchase when securities in its swollen portfolio mature results in new issuance and sale to the dealers—-that is, ultimately to real money savers. As Wolf Richter reminds in the post from which the above chart is extracted, the $20 billion per month shrinkage which happened in January will escalate to $30 billion per month in Q2, $40 billion per month in Q3 and then $50 billion per month in Q4 and for a considerable period thereafter. There is exactly no secret about this schedule, nor a shred of evidence that the law of supply and demand has been repealed. So after touching a generational low at 1.36% on July 8, 2016, the bond yield has already begin to rise sharply in anticipation of the rapidly escalating central bank drainage of cash from the dealer markets. But there is something more. The same front-runners who functioned as private quasi-central bankers by sequestering debt paper in repo silos alongside the real central bank vaults, are not waiting around for the central bank bond dumping campaign to reach full stride. In fact, when the 10-year UST hit 2.85% today that represented a 45 basis point rise since the last day of 2017. Stated differently, it also meant a 16% mark-to-market loss for repo carry traders since the turn of the year, and, in theory, a 48% loss since the generational bottom 19 months ago. Needless to say, no hedge fund that wishes to survive is going to sit patiently on their repo silos at 95% leverage after their tiny slice of equity in the trade has been mauled and they are called upon to post more collateral. To the contrary, as the bond yield reset accelerates, they are likely to not only begin selling with malice aforethought, but also to actually pivot to the other side. That is, start “shorting” what in effect the Fed has announced it will be shorting to the tune of $600 billion per year commencing next October. So the quasi-hidden “accelerator” effect of the bond market front-runners is now about to shock both ends of the Acela Corridor. When the 10-year note pierces the 3.03% yield mark, where it topped out after the original Bernanke taper tantrum in 2013, it will be off to the races as the chart-driven robo-traders pile on. To be sure, this will be described by Wall Street stock peddlers as an “oversold market”, which presents another swell opportunity to jump back in and buy the dip. We sincerely doubt it. To the contrary, we think the denizens of the Imperial City are going to react badly as the carry cost of the Federal debt soars. Rather than the congealing of a last minute majority to kick-the-can, as has occurred so many times since August 2011, we think the kicking this time around will be more akin to that of a Polish firing squad. That is to say, the fiscal bloodbath we have been predicting is now on the doorstep of Capitol Hill. As the latter stumbles from one false start to the next, and resorts to hideously abbreviated CR and debt ceiling fixes, the pandemonium will soon hop aboard the Acela and reach the canyons of Wall Street in no time. As we said earlier this week: If you are still in the casino, run, don’t walk, toward the nearest emergency exit. The Trumpite/GOP is about to learn that deficits do matter and that what really ails the economy of Flyover America is the destructive Keynesian posse domiciled in the Eccles Building.